Jon Wilkin has no intention of hanging up his boots on a illustrious and trophy-laden career at St Helens. The Yorkshire-born Great Britain and England international started his rise to the top at Hull KR before heading across the Pennines to Knowsley Road in the summer of 2002. 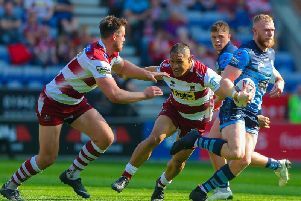 Since then he has played nearly 400 games for Saints in a variety of positions, scoring 93 tries and helping them to lift the World Club Challenge, the Challenge Cup and the Super League title, as well as the League Leaders’ Shield. Wilkin also revealed that they had held an positive meeting on Monday to map out the future and where the club was going. Obviously, he had been hoping his season would end with victory over Cas in the play-off semi-final at The Jungle and a date at Old Trafford on Saturday. But he was magnanimous in his praise of the Tigers’ sudden-death 23-22 win and felt on their performance during 2017 they deserved a spot in the Grand Final. “They have been exceptional all year - even though it took me several days to believe the result of our semi-final meeting,” said Wilkin. It seems a case of the boot being on the other foot for once as far as the rugby league’s great escapologists are concerned!